Hey Love: Finds Under $40! Get The Look! Anne Hathaway! Finds Under $40! Get The Look! Anne Hathaway! Happy Friday Loves! Yay for the weekend! 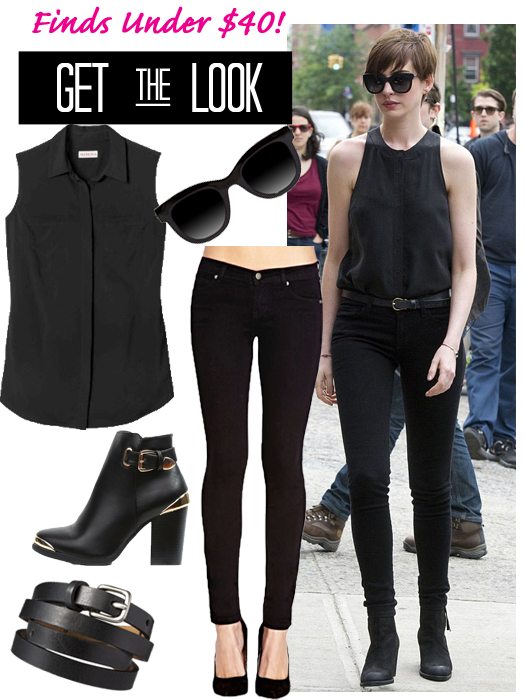 This week's Finds Under features the lovely Anne Hathaway. When I saw this look I knew I had to recreate it. There's something so sleek and cool about an all black outfit. Anne looks so put together and fierce in this look. The sunnies are a great touch! Check out my finds below! You can get the entire look for just over $100! Love it! **P.S. I'm going to start offering more expensive pieces just in case you want to check out those alternatives! Such a great outfit, all blacka nd so chic! Love this type of post! Such a great look. So chic in black. Ohhhhhh loving the all back and those boots are fabulous!! Great blog! I would love to stay in touch and followed you, would you check out my blog and maybe follow back?! Wow, love how you found all individual pieces to be under $40, very nice. Looks just like that. What a great find on those boots! Too cute! She looks amazing as always! Thanks for the affordable picks!